Magic Touch Piano Musical Toy is rated 4.9 out of 5 by 22. With the delicate touch of her little fingers, Baby Einstein and Hape’s Magic Touch Piano will let baby create thousands of different songs. 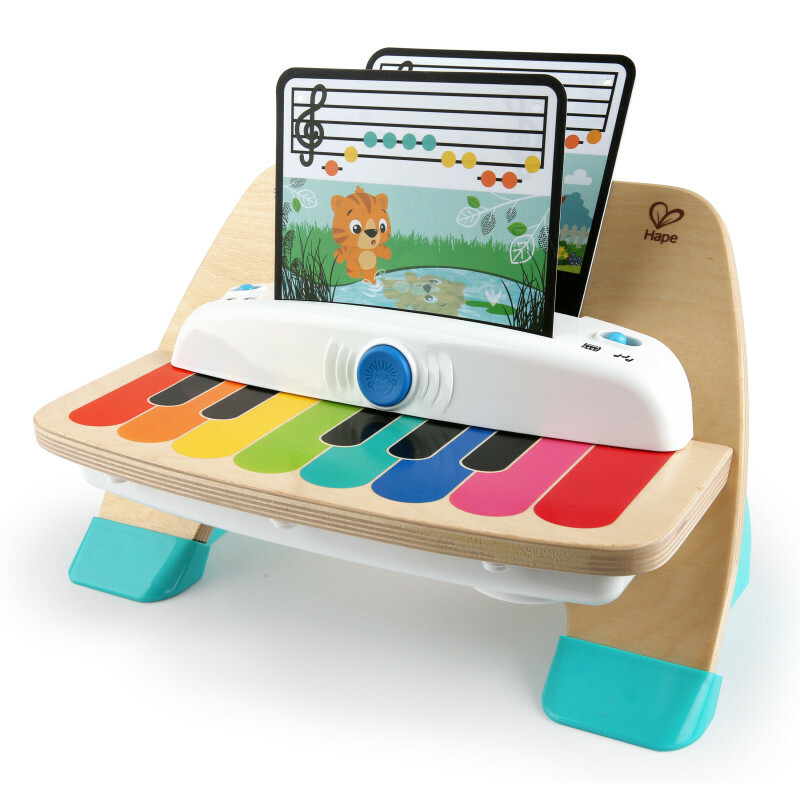 Made from wood, this piano toy features magic touch technology – no buttons or keys needed! Two modes of play give your toddler the ability to make her own music or play along with classic melodies. Giving your baby toys that make music helps her tune into different rhythmic patterns and sounds at a young age. This musical development toy comes with 3 sheets of music. She’ll practice color coordination by matching the color-coded notes on the sheets to the keys on her piano. But this toddler toy isn’t just for kiddos — join her at the piano bench to have just as much fun! And don’t worry about waking little brother or sister. The volume control buttons let you turn the music to “low” when you need to, or crank it up to “high” for a main-stage piano performance. At either volume, the higher end quality speakers make sure your baby’s sonata sounds just right. Wooden piano magically makes music! Dimension (in) 12" x 5" x 9"
Rated 5 out of 5 by Crystalb2286 from Awesome toy! This is an awesome toy! Love the easy to use feature of the toy! It is easy to use sits low to the ground and I love the look! Rated 5 out of 5 by seanok from Innovative Product Really cool idea! Incorporating the wood and electronics is really different and my kids like to play all of the different songs. Rated 5 out of 5 by epike from Unique, fun and great quality! I was SO excited to receive this piano for my musical loving toddler, the fact I had never seen anything like this before made me even more excited. She instantly fell in love with it when she started playing. She likes pressing the touch keys to make music, as well as putting it in the auto play mode. The sheet music it comes with is great for helping teach colors/matching and to learn to play the songs she has been hearing. It is a great quality toy, the wood/plastic combo is a perfect mix. This can definitely be used by all ages and enjoyed! Rated 5 out of 5 by Sandra03 from Fun for all ages! Both of my kids love this toy. My toddler (2yrs) enjoys playing and following along the music sheets to create the songs. He loves saying the colors when he touchs the keys. My daughter (16 months) also enjoys just tapping along and dancing. I like that you can press the blue button and just listen to music. It’s a very nice toy that we definitely recommend.